Sweet and spicy zucchini relish is a terrific way to use up all of those zucchinis from your garden. It’s best to use small-medium size zucchinis. The one on the bottom of the pile is too big for relish. It seems like every summer our zucchini plants produce high yields that we can’t eat or give away fast enough. We pick them almost every day for several weeks and then we are in a mad rush to eat them while they are fresh or process them for later use. We start off by eating them for breakfast, lunch and dinner. We then turn to our classic Zucchini Bread recipe to make several loaves to eat, freeze, and give to our friends. 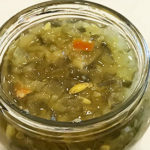 And of course, one of our most popular recipes on this website is Grandma’s Zucchini Relish recipe. My Grandmother made it for years and we have been making it ever since I can remember. We wanted to spice her recipe up a little so last year we combined her recipe with our Spicy Pickle Relish recipe to make Sweet and Spicy Zucchini Relish. The combination of the two recipes came out perfect! The sweet and tangy flavor of classic zucchini relish is enhanced by a little heat from jalapeno peppers. 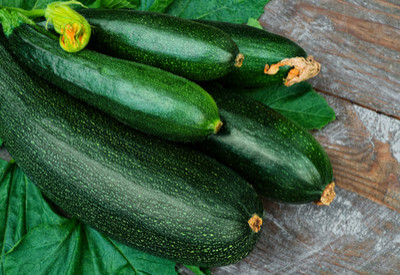 Each small to medium zucchini yields approximately 1 cup of sliced zucchini. You can adjust the intensity of the heat by removing the ribs and seeds of the jalapenos. You can also adjust the amount of peppers that you use in the recipe based on how spicy that you like it. And we always, always, taste the jalapenos before adding them to the recipe. That is because our late season jalapeno peppers are much hotter than our early maturing peppers. And both are far more intense than the ones that you purchase at the grocery store! When making this recipe, you can spend time dicing your vegetables with a cutting board and knife. However, using a food processor like our Hamilton Beach Food Processor, will make your life so much easier and this recipe so much easier to prepare! Sweet and Spicy Zucchini Relish ready to cool in the refrigerator. 1. Place sliced zucchini in a food processor and pulse several times until they become small pieces. Pour zucchini into a large colander in the sink to drain. 2. Cut onions and peppers into slices. Place them into the food processor, in batches if needed, and pulse until they become the same size as the zucchini. Place onions and peppers into the colander with the zucchini. 3. Add 1 tablespoon of salt to the vegetables and stir well to coat. Let the vegetables drain for at least 30 minutes. 4. With about 10 minutes left of draining, in a large stockpot, mix together the remaining ingredients. Bring to a boil. 5. Add vegetables and return to a boil. Reduce heat and simmer for 30-45 minutes. Remove pot from heat, and let cool to room temperature. 6. When liquid is cool, using a slotted spoon pour relish into an air-tight container or sterilized mason jars. Add some of the liquid to barely cover the top of the relish. *Fresh relish can be kept in the refrigerator for up to one month or process in a hot water bath using hot relish for 15 minutes. 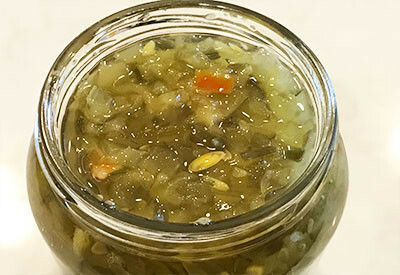 Zucchini relish that gives a sweet and spicy flavor that is perfect to use as a condiment or for ingredients in deviled eggs, tuna salad, and much more! 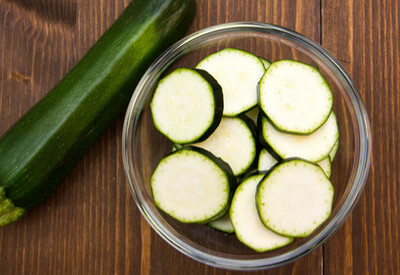 Place sliced zucchini in a food processor and pulse several times until they become small pieces. Pour zucchini into a large colander in the sink to drain. Cut onions and peppers into slices. Place them into the food processor, in batches if needed, and pulse until they become the same size as the zucchini. Place onions and peppers into the colander with the zucchini. Add 1 tablespoon of salt to the vegetables and stir well to coat. Let the vegetables drain for at least 30 minutes. With about 10 minutes left of draining, in a large stockpot, mix together the remaining ingredients. Bring to a boil. Add vegetables and return to a boil. Reduce heat and simmer for 30-45 minutes. When liquid is cool, using a slotted spoon pour relish into an air tight container or sterilized mason jars. Add some of the liquid to barely cover the top of the relish. Approx. how many pint or quart jars does this recipe make? Thanks. You can use it as a condiment for sandwiches and hot dogs. You can also put it in egg, tuna, chicken salad recipes. We have even used it in our meatballs and meatloaf recipes before! This sweet and spicy recipe we have even used it in spreads and dips to serve with crackers. What do you use the relish for? What foods do you put it on or eat it with?